Mmmmm, just like Mom used to make! 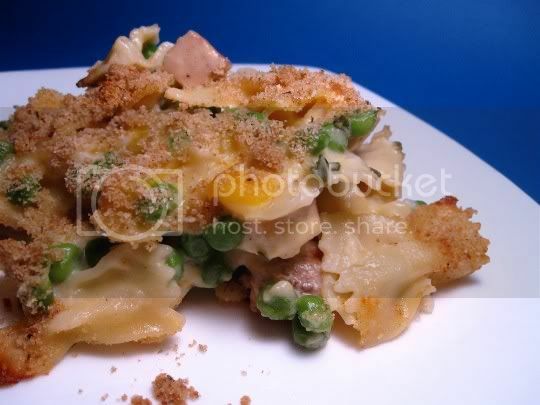 It's really mind-boggling how much this recipe strangely tastes like tuna noodle casserole. I suppose it's something about the ingredient combination: salty and savory baked tofu (to stand in for the tuna, of course), a sharp cheddar sauce, sweet and juicy peas, and even a crunchy breadcrumb topping. Although the recipe calls for smoked tofu, I used a savory baked version that worked quite well. There are also yellow bell peppers, which add a mild pungent sweetness and some great crunchy and juicy veggie texture along with the peas. The cheese sauce is super creamy, but you'll be in disbelief that it's actually lowfat. Fresh thyme gives the dish an herbal, woodsy flavor that the Italian-seasoned breadcrumbs further intensifies. I didn't make this in a Dutch oven as suggested, and I think my way was actually a lot more time efficient. Otherwise, you'll be doing the three major steps one at a time, and they can easily be done simultaneously. While I got the pasta water going in a large pot, I sauteed the bell pepper, peas, garlic, and fresh thyme in a skillet. Once the pasta started cooking, I started working on the cheese sauce. Lowfat milk was heated with flour for thickener; the cheese was stirred in until smooth and evenly mixed. I seasoned the sauce with 1/8 teaspoon pepper and 1/4 teaspoon salt, and it was perfect. When the pasta was al dente, I drained and rinsed it, returned it to the pot, tossed it with olive oil, and then added the bell pepper mixture, diced tofu, and cheese sauce. I mixed everything until combined, then poured into a 7x11-inch baking dish (which actually turned out to be the perfect size). The breadcrumbs were amply sprinkled on top before baking. In the end, you'll have a hearty and super satisfying meal that you'll probably want to go back to for seconds (like I did). Leftovers aren't quite as creamy (but they're still tasty), so this dish is best served right away...piping hot from the oven! Make again? Definitely. I'd actually be excited to serve this to a meat-eater. Vegan variation: Substitute soy milk and vegan cheddar.